Now, I know most people are thinking of Vivaldi with the title of this post. But it's not! :) We've created a new bracelet with a variety of beads. 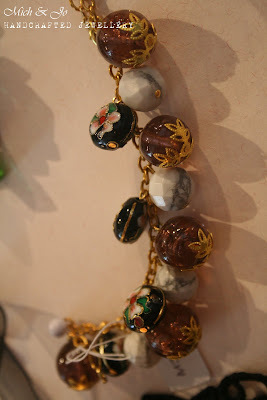 Chinese and brown glass beads and howlite stones with gold plated findings. We think it resembles the four seasons with the variety of colours, flower and leaf motifs.